These beautiful mugs are handmade in Lawrenceburg, Kentucky and make the perfect gift for the Kentuckian in your life. With a small Kentucky state shape boasting a red heart, these are sure to be a big hit in your home! 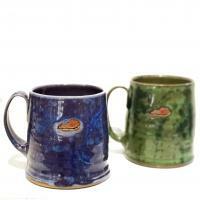 Only food safe glazes are used in these mugs. They are also dishwasher & microwave safe! Top shelf in the dishwasher is recommended for longevity. This mug is available in a forrest green or a deep purple/blue combination - please specify in the comments section of your order which color you'd like if you have a preference.